When Ghana secured a 1-0 win over Mozambique in the Southern African state's Independence anniversary match last Friday, it echoed the Black Stars' declaration that “we will dismantle The Cranes”. Indeed, the Stars' World Cup qualifier against The Cranes of Uganda in Kampala on Saturday evokes memories of the past.Parading as age-old underdogs in African football, Uganda's Cranes braved all odds and battled the Stars to a 1-1 draw in Kumasi last year. 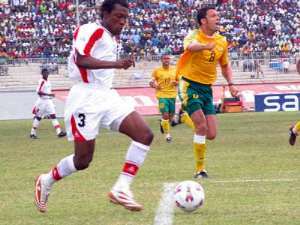 The result and a subsequent 1-0 defeat by Rwanda in Kigali put paid to the Black Stars' march into the 2004 Nations Cup in Tunisia, denying the four-time African champions a seventh successive appearance at the continental event. The occasion was only a playback of a familiar trend that has characterised the Black Stars' campaigns in major competitions. And as both countries relive memories of their last meeting, the pain of Ghana's failure might be deeper in the heart and mind of Stars' skipper Stephen Appiah. The Juventus midfielder was a prime character when the East Africans helped to strip Ghana of a Nations Cup appearance early this year. The occasions differ, and the present goal also remains a huge target now. With Saturday's game also serving as a qualifier for the Nations Cup, Appiah's motivation to lead the Stars into the continental biennial event could not be any higher. An emphatic 3-0 victory over Bafana Bafana took Ghana to the top of the group, and the men who enacted that episode, including goalkeeper Sammy Adjei, Baffour Gyan, Dan Quaye, Michael Essien, Samuel Osei Kuffour, Sulley Muntari, William Tiero, John Mensah, Ibrahim Tanko and Addoquaye Pappoe watched or participated in the team's 1-0 triumph over Mozanbique last Friday. Gladly, Coach Barreto now possesses Lawrence Aidoo and Asamoah Gyan, two players, who, through injuries, deprived the Stars of valued striking options.Saturday's meeting in Kampala, like the other two games in the group, represents the real challenge for the leadership of the group. Uganda have in their midst David Obua, scorer of two goals in the campaign so far. Pitched against Apiah who has three goals, the two will fight for the goalking race aside the three points at stake.